Engine size is typically stated by the volume of air that is displaced by the piston as it travels through one stroke. The volume that the piston can displace is commonly called swept volume. The unit of measurement commonly used will be Cubic Centimeters and/or Cubic Inches. To calculate the displacement of a given engine, we must know some basic engine terminology. See diagram below. A Bore The bore of the engine is the diameter of the cylinder. 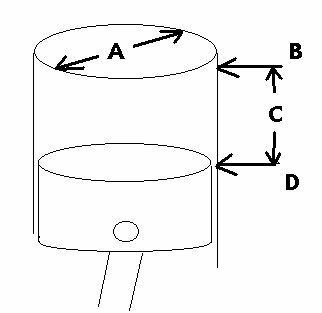 C Stroke is the distance the piston travels in the cylinder. B TDC- Top Dead Center the upper most point the piston reaches in the cylinder. D BDC- Bottom Dead Center the lowest most point the piston reaches. Therefore the stroke of the engine is equal to the distance from TDC to BDC or vice versa. Now we have to go back to math class. We all sat there and said when will we ever use this. Well guess what there is a purpose to the formulas they drilled into your heads. If you remember the formula to calculate the volume of a cylinder it is: Volume of cylinder is equal to Pi times radius squared times height. Now you try it for the GX200 It has a bore of 68mm and a stroke of 54mm. If it is a multiple cylinder engine multiply by the number of cylinders the engine has.